Keep those eggs uneaten and your chicks unharmed! Eggs are easy sources of food for snakes—they can often become unwanted visitors in chicken coops. Chickens are not endangered by snakes, in fact, the birds will attack/eat small snakes. Snakes may try to eat baby chicks, so take extra precautions as your young chickens grow. Species like the Texas Ratsnake will try to find their way into the coop in search of eggs. Here is a Texas Ratsnake taking advantage of an easy meal. This non-venomous snake slithered into the chicken coop through a ventilation opening. Secure openings: Check for any holes or cracks in your coop. Even small openings should be considered possible points of entry for snakes. Use a fine wire mesh or a weatherproof fabric to securely cover these openings. If you find areas that are difficult to cover with mesh, try rolling up pieces of chicken wire and inserting them into irregular surfaces. Bury an “apron”: Dig a trench around the coop, and bury more of the mesh used to cover openings. This will keep snakes and other animals from entering the coop by digging or squeezing underneath. Learn more about adding this security feature to your coop from Backyard Chickens. Remove food sources: Try to remove eggs frequently, as these are a major attraction for snakes. Further, do not leave food in the coop or run that might attract rodents, as these animals are also food sources for snakes. Clear the yard: If there are not snake-friendly hiding places in your yard, it is less likely that snakes will hang around to look for eggs. Remove piles of brush, logs, and rocks if possible. Use a trap: If none of the above methods work, consider using a minnow trap baited with eggs. These traps are made of a wire mesh large enough for snakes to enter, but that they are not typically able to leave. After trapping a snake, quickly call a professional in your area to relocate it safely. Do not use glue traps or poisons/chemicals; these are inhumane to snakes and the chemicals can harm your chickens inadvertently. 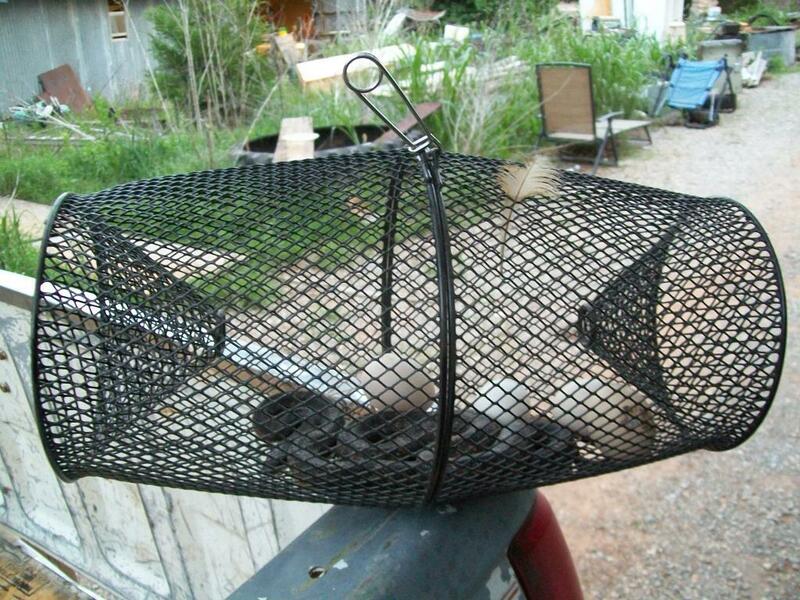 Shown here is a snake trapped in a minnow trap that was baited with eggs. Follow these steps and your coop should be snake-free!